The Women in IT executive mentoring (WITEM) program supports executive women working in digital and ICT roles. The program matches women with senior IT leaders from across the Commonwealth government for a year and provides a supportive mentoring environment. Mentor nominations for the 2018/19 program are closing soon. Our CEO, Randall Brugeaud reflects on his experience as a mentor. I’ve been involved in formal and informal mentoring over many years. I mentor both women and men, but WITEM is designed specifically for women in IT. Inclusion and equal opportunity are very important to me and I’ve been involved in a range of disability and reconciliation programs as well. These include the establishment of the Dandelion program at the Department of Immigration and Border Protection (now Home Affairs) and time as the Senior Reconciliation Champion at the Australian Bureau of Statistics. My wife and I have three daughters, so my desire to be involved in WITEM is very personal. My eldest daughter studied IT while she was in college and ended up topping her year at the end of Grade 12. Even though she had a father who had worked in the industry for many years and she had clear aptitude and potential, she ended up studying a non-technical degree at university because she couldn’t see a place for herself in IT. Our industry seems to have an unquenchable thirst for talent, so we need to ensure that women are drawn to STEM-based roles, including IT. We don’t have the balance right as yet, but the WITEM program is helping to build the skills and confidence of the women who will be our future technical experts and leaders. The first step in getting involved in the WITEM program is to put your hand up to be a mentor or mentee. Once selected, a matching process brings people together based on their work histories and personal characteristics. Mentors and mentees are then introduced and taken through the basics of a mentoring relationship — Mentoring 101. Help is available to establish mentoring agreements, but these can be quite informal. Regardless of the level of formality, it’s important to agree on your objectives — what you’d jointly like to achieve over the next 12 months. After that, it’s a matter of getting to know one another and having regular conversations that help to move you toward the achievement of your objectives. How regularly you meet is up to you. I personally meet with my mentees on a monthly basis, and this feels about right. I should also point out that ongoing support is provided for mentors and mentees. Checkpoint meetings and workshops are organised by the program coordinators and review sessions are held a number of times throughout the year. The high level WITEM approach is consistent year on year, but every relationship is different. Mentors need to be flexible in order to meet the needs of their individual mentee. For example, one of my mentees was impacted by a machinery of government change part way through the program and this meant that we changed tack to deal with the issues she faced during a major change in role. During this time, we increased our meetings to fortnightly and spent a lot of time working through how she would establish herself in a new organisation and build the relationships she needed to be effective. Another of my mentees was in a very technical implementation role, so we spent our time talking about technical implementation planning and program management. In the end, it’s about being able to pivot and provide what the mentee needs at any point in time. Effective mentor/mentee relationships are built on trust and honesty. You sometimes find yourself in very personal discussions where the need for mutual trust is paramount. I’ve had conversations with my mentees on things like what they really think about their managers or staff, what we’d like to tell our grandkids about what we did in our careers and the things that keep us awake at night. These conversations need to be treated with privacy and respect and be physically located outside the mentee’s work environment. Mentor/mentee relationships often extend well beyond formal programs such as WITEM. I currently have about a dozen mentees that I keep in touch with on a semi-regular basis. Most often the relationships are maintained by my mentees and this seems to work best. Although I come into contact with quite a number of my mentees as part of my normal business interactions, I always make myself available for one-on-ones if they reach out to me. New mentors can sometimes spend too much time sharing their personal experiences with their mentees. Although this can be very interesting, it’s not the best approach. In my experience, it’s far more important for a mentor to listen and understand before sharing their experience or offering advice. You’re not there for you, you’re there for the mentee. As the saying goes, we have two ears and one mouth and we should use them in those proportions! My next tip relates to the mentor/mentee fit. Although the matching process is very good, it’s important to let the program coordinators know if the relationship isn’t working. I haven’t needed to make a switch, but I know a few people who have. In one case it was due to philosophical differences, in another it was relevance of skills and work experience. My advice is to give it a go, but don’t persevere if the relationship isn’t working. Mentors learn far more than they might expect. As part of the recent end of program review, mentors and mentees were both asked to reflect on the things they learnt. Without exception, mentors said that they couldn’t believe how much they learnt from the experience. I’m most definitely a better leader as a result of being involved in the WITEM program. 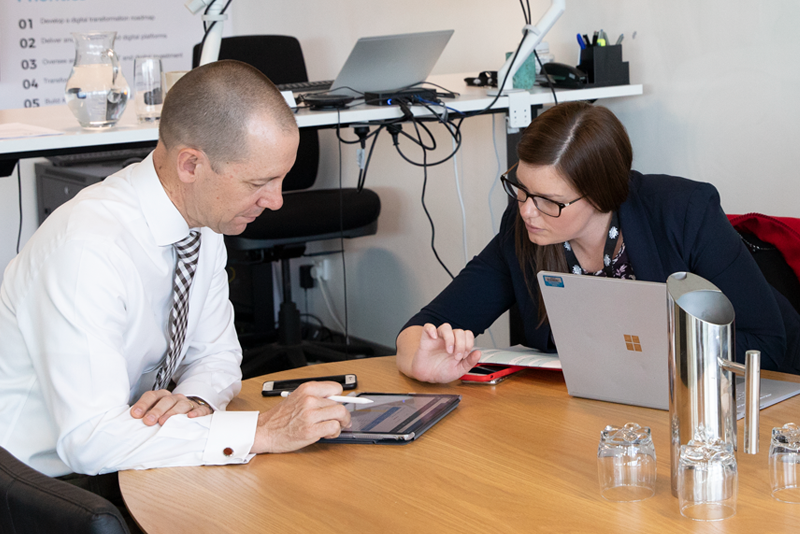 Senior IT executives can nominate themselves as mentors by emailing womeninit@digital.gov.au by Thursday 9 August 2018. Randall Brugeaud is the Chief Executive Officer of the Digital Transformation Agency.